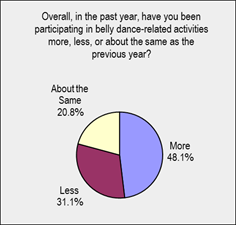 Welcome to the first installment of the results of the 2012 Belly Dance Community Survey! 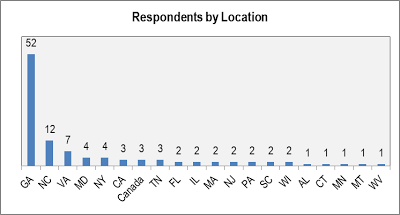 We had a total of 107 respondents, and their input provides some great directional input for event producers on the state of the belly dance "consumer" market. Please note the word "directional" -- with 107 responses, this survey is not a statistically significant profile of the community's needs. However, especially where the response is substantial (i.e., where the numbers are big), the results should provide direction for decisions in planning your offerings and communications to this market. My day job is in marketing, and the best marketing is always based on an understanding of what the market really wants (and most importantly, what they will pay for). Most belly dance-related business owners can't afford to do the kind of research that will give them these insights. 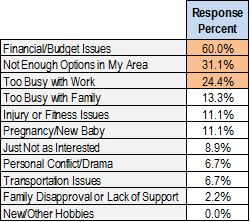 As with last year's survey, my goal was to combine my marketing capabilities with my access to the belly dance community and begin to provide some insights that will make the community stronger... making the "producers" more successful by getting the "consumers" more involved. I'll be sharing the insights from the survey in several installments. The first will focus on the locations of the respondents, their level of participation in belly dance-related activities (and what's keeping them from participating more), and what offerings they'd like to see more of in their local communities. Please feel free to ask any questions about the results. 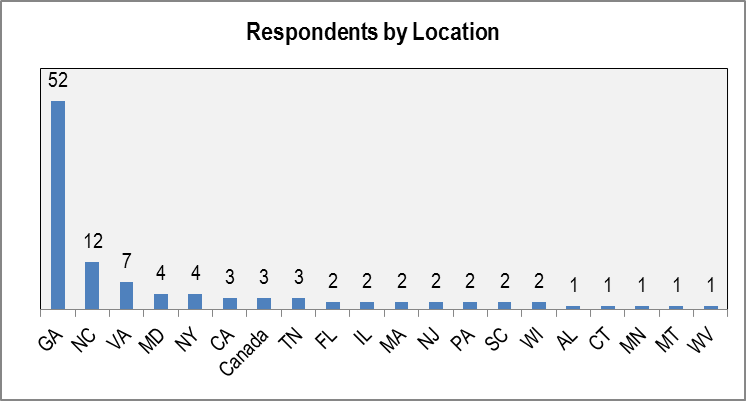 One big change versus last year's survey was the diversity in respondent locations. While the majority of participants were from Georgia, many other parts of the country were represented this year by at least a few responses. Plus we had a few from Canada! 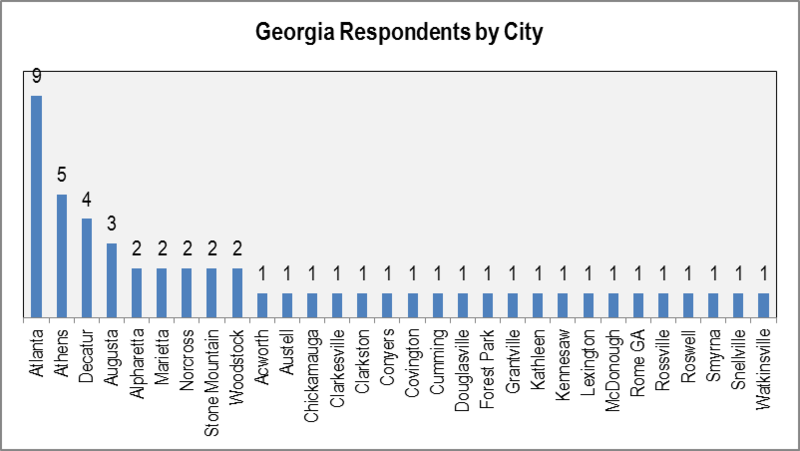 About 65% of last year's respondents were from Georgia, while this year Georgia residents made up 30% of the total. 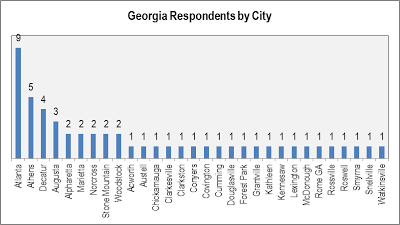 A number of communities within Georgia were represented, with 25% intown residents and the rest from suburban communities and cities and towns outside metro Atlanta. Good news for event promoters, instructors, and vendors serving the raqs community! It looks like overall participation is up slightly this year. In this year's survey, 48.1% of respondents indicated that they have participated more over the past year -- an increase of 30% over last year's 36.8%. I have increased participation in spite of politics/drama and try to not participate in it. Too much drama amongst dancers, lack of professional courtesy and respect for others, growing cliques as well as the decreasing standards in performances and costuming. Found out too late about fabulous opportunities to make alternate plans, or event was sold out by the time I learned of it. Or two events conflicted with each other and it divided the local community. Too many people trying to do events that are just conflicting with everyone else's events. Makes it hard to near impossible to support the community. It's important to try and start talking to one another so that these events can either 1. co-mingle some of these events or 2. not step on top of other events. My two local-ish teachers both stopped teaching, so my regular instruction suffered, but I travelled more for workshops and started teaching myself, so my overall dance hours stayed about the same. Teacher stopped teaching style I was learning! It's hard to find classes on the weekend and I can't commit to anything during the week due to family and work commitments. Because of budget issues I have become more selective about what workshops I will take. Even if money wasn't an issue there hasn't been that many this year and the work shops that were around the topics didn't appeal to me. I have become more involved in performing but less so in training in classes due to the exclusion of male dancers from many dance classes. With respect to women's spaces, I wish there were more unisex options in my area. As with last year's survey, we wanted to find out what raqs enthusiasts want more of (or less of) in their local communities. Last year's top three responses in the "More, Please!" category were one-day local workshops, academic lectures, and costuming/sewing instruction. This year's #1 response was music classes, with 73% of respondents hoping for more instruction in music! So if you've got a workshop planned for 2013 that includes classes in drumming, singing, music theory, or other topics related to the music that accompanies the dance, you're on the right track. Ditto academic lectures; raqs enthusiasts are eager to go beyond movement to learn more about history and culture. Finally, respondents requested more private parties and haflas for social dancing, as well as more workshops (though some indicated that they don't need more weekend-long workshops in their area). Which offerings have reached a saturation point? 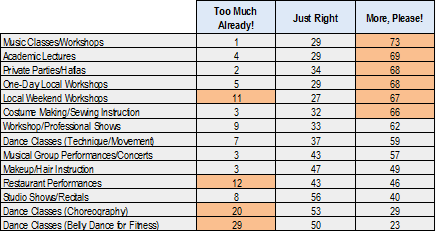 A number of respondents indicated that they don't need more choreography or "belly fitness" classes; there is quite a bit of demand for more technique-oriented classes. But overall, responses to this question can be summed up as "more everything!" In the next installment of our survey results, look for input on how raqs enthusiasts decide which events to attend, how they prefer to learn about upcoming events, and how event producers can improve their communications to the market. Of course I'm delighted to read results of a survey in which I participated. But more importantly, it is reassuring to find I am in the majority looking for "more". I was beginning to feel I had an unhealthy obsession. Now I know there are many obsessed sister dancers out there. Ha! Admitting you have a problem is the first step, right?!? Belly dance is so fulfilling and has so many facets that the way it can take over one's life doesn't really surprise me! Oh, and thank you for participating and engaging!